Known as the 'Gibralter of East', the very popular Raigarh Fort holds marvelous attraction for Maratha history lovers and captivates many visitors from all across the world. It has a very popular wall "Hirakani Buruj", built over a huge cliff. This fort was built by The Maratha king Shivaji when he was crowned the King of a Maratha Kingdom and later it was developed into the Maratha Empire. 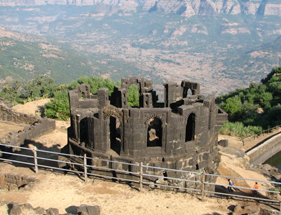 Located in the Sahyadri mountain range, this fort is set 820 meters above sea level.